Mersal featuring Vijay, Samantha, Kajal Aggarwal and Nithya Menen directed by Atlee is all set for a grand Diwali release this year. This is the second film Vijay- Atlee combo after their successful union in Theri. 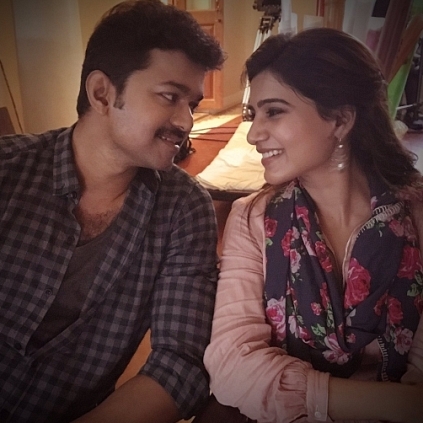 Meanwhile, the shooting of the film is wrapped up today and Samantha confirmed the same on Twitter to say, “End of #Mersal. 3 awesome films #kaththi #Theri #Mersal and it was an absolute pleasure working with him. #manoffewwords #friend #respect🙏"
Our Sources say the unit has shot a song montage for the past four days with Vijay and Samantha, and now the team will be focusing with the post-production work. Mersal also has Sathyaraj, SJ Suryah, Vadivelu and Sathyan in important roles. People looking for online information on Mersal, Samantha, Vijay will find this news story useful.